It has been said by some that the Indigenous or Aboriginal vote could make or break majority governments, particularly the last federal election. 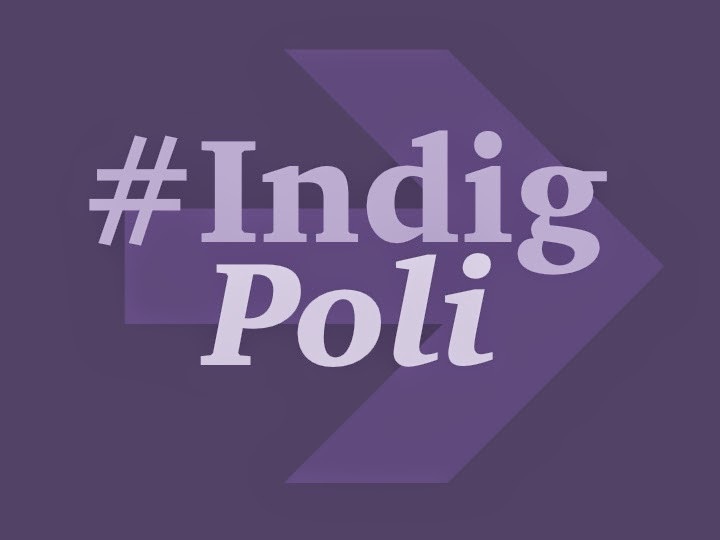 Respected political analyst Eric Grenier who runs the popular blog ThreeHundredEight wrote an article for the Globe and Mail in 2013, in which he stated that if native people voted in higher numbers we could have prevented a majority Conservative government. It has been said that Indigenous people don't vote in high numbers, but when you look at some Chief and Council elections the vote can easily exceed eighty percent of eligible voters. 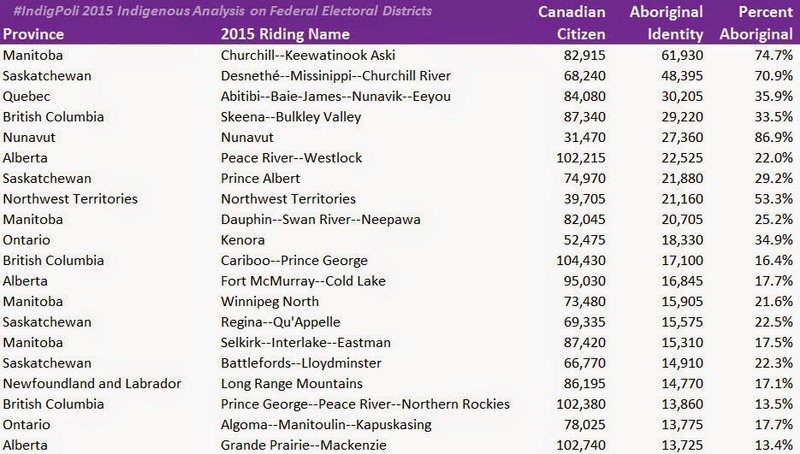 Generally, Federal electoral district changes are reviewed after a census has happened. 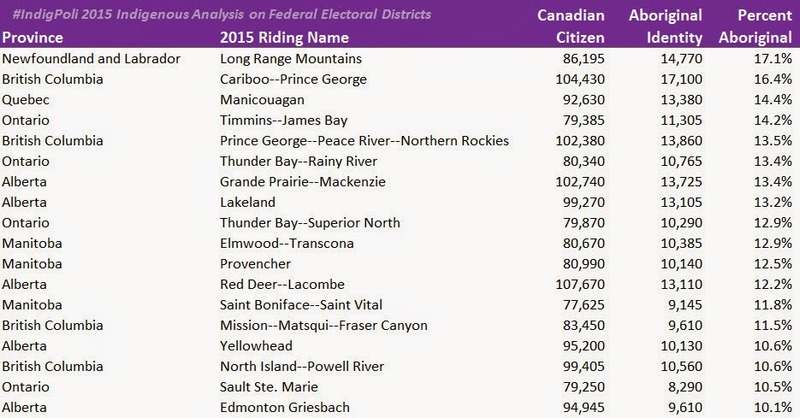 The goal is to ensure that electoral ridings have a similar amount of people living in every federal riding, if not the government changes the geographic border of ridings. 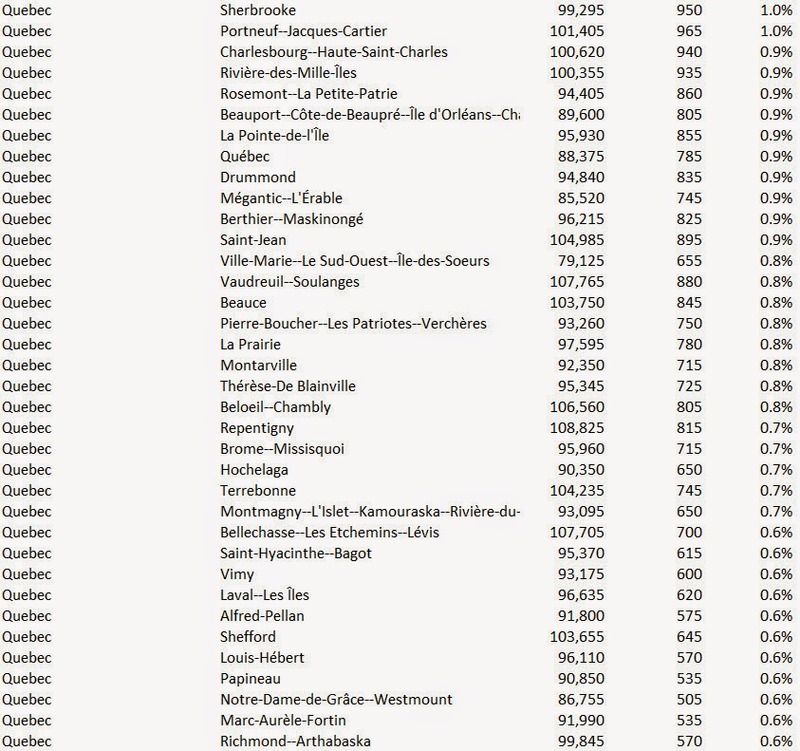 Since the last federal election, the electoral redistribution commission proposed 338 new ridings from 308. 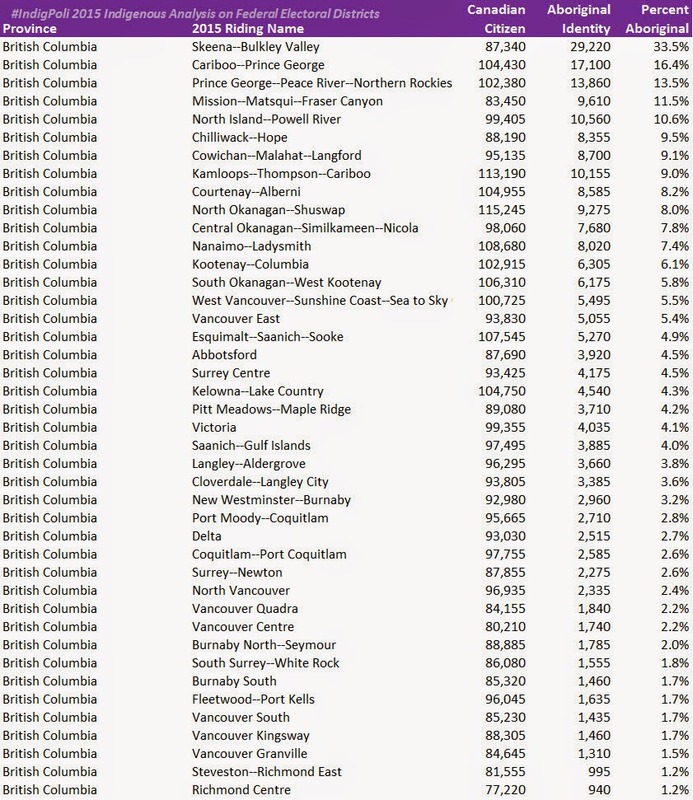 With this distribution came a change to the geographic boundaries of Canada's 338 new electoral districts. 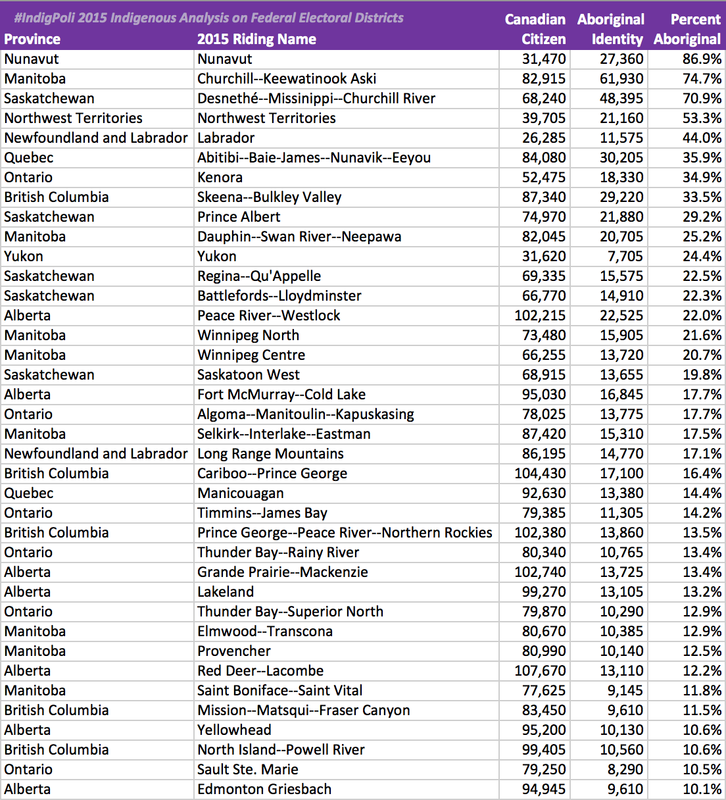 This blog post explores the power and opportunity of the indigenous vote in these new ridings on the 2011 federal census, national household survey. 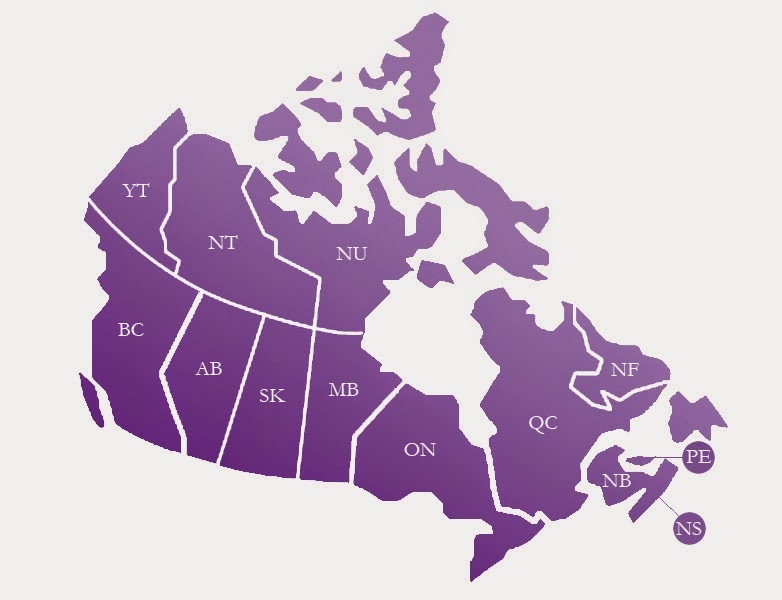 As a disclaimer, it is often noted that the Indigenous people don't participate in the Census at the same level as other Canadians and recent changes to the census may undercount or skew the actual real population. Also, these numbers are based on the general population, not the voting age population. However they do give a glimpse into the Power of the Indigenous Vote and how we can vote to choose the government that we want. 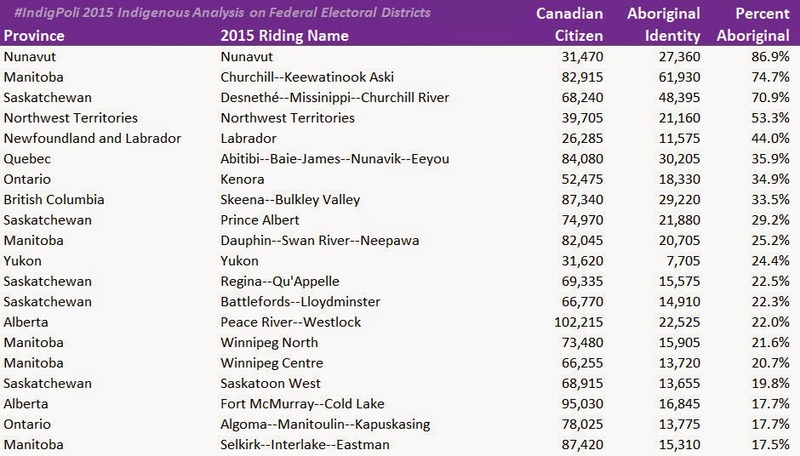 Below we break down by the Aboriginal vote potential by population/percent, then we provide the overall Aboriginal population riding-by-riding based on province of territory. 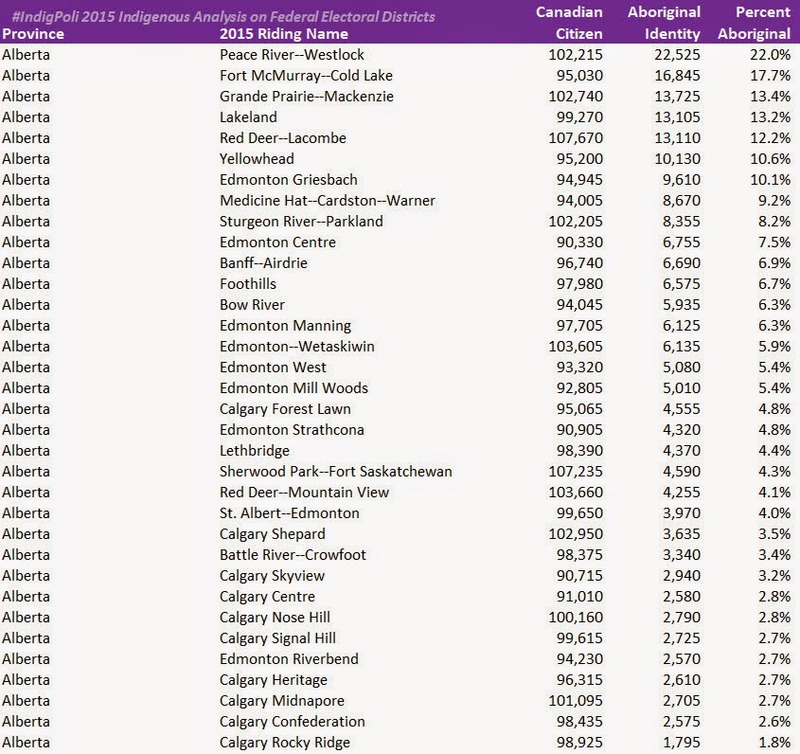 Top 38 riding where the Aboriginal Vote is over 10%. They are ordered first by the size of the Aboriginal population and secondly by the percent of Aboriginal population compared to that of the total riding. (click to enlarge). Source: Statistics Canada. 2013. National Household Survey Profile. 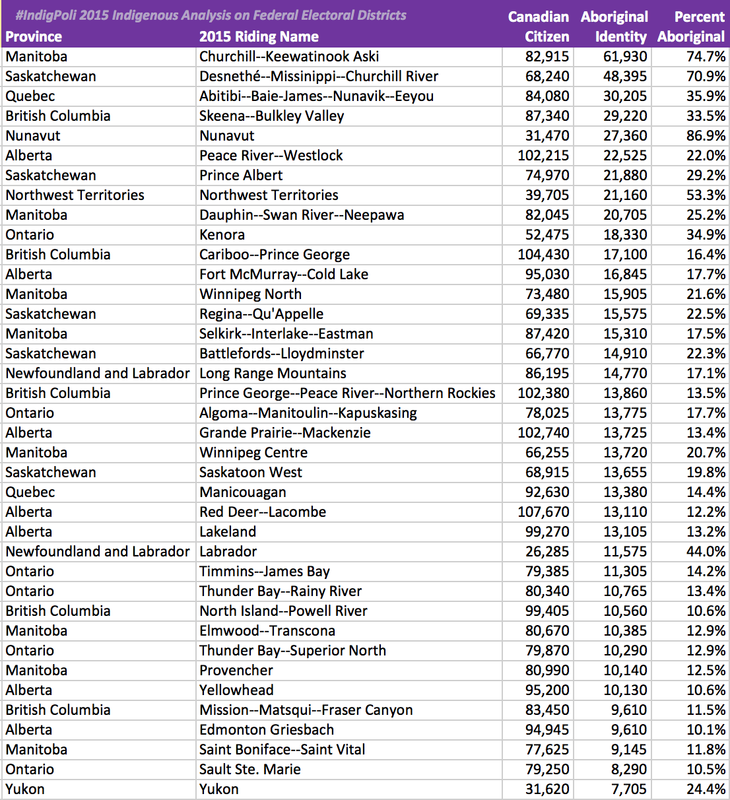 2011 National Household Survey. 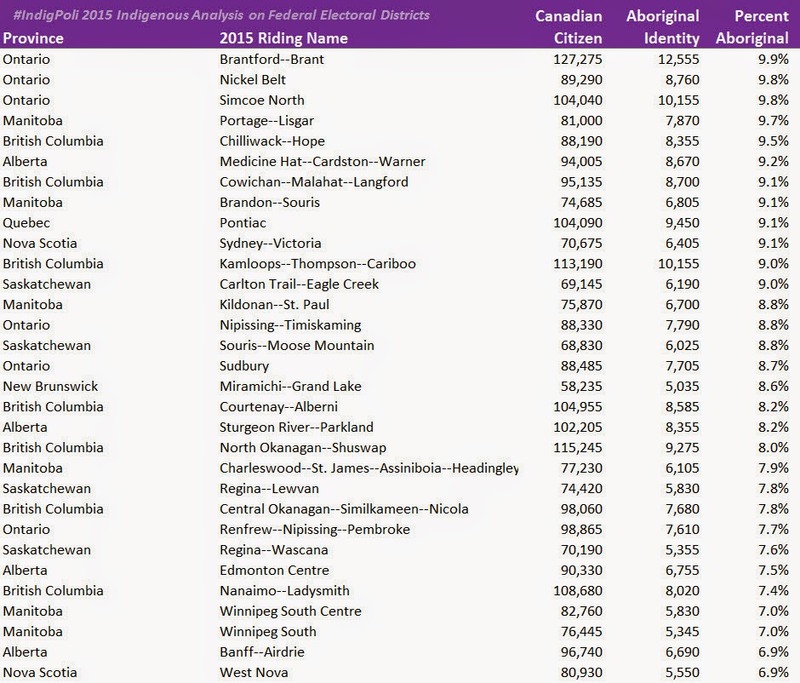 ***These numbers do not reflect those who choose Aboriginal ancestry and another ethnicity. 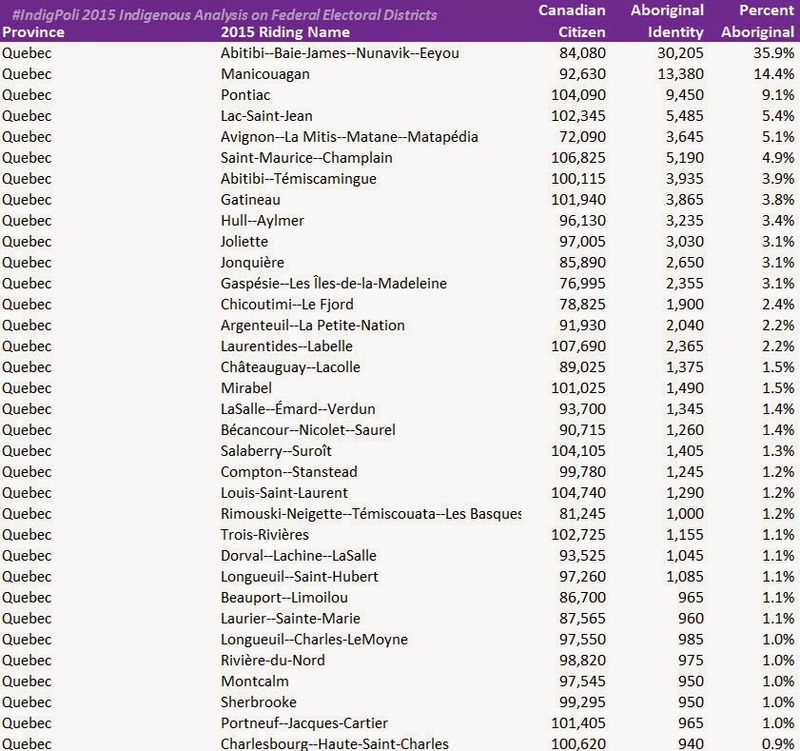 ***The is in comparison of what the Aboriginal ancestry population is within Canadian citizens.